As well as the beaches on the coast there are lakes in the Vendée that have beaches. Although these beaches are not usually as sandy as the coastal variety, they nevertheless offer a chance to relax next to the water and partake in most of the activities that you will find on coastal beaches. Apremont: The damming of the River Vie has created a large lake where, near the dam, it is possible to swim and hire boats. There is great fishing along its shores, with refreshment facilities on site. Rochereau, here the barrage at Sigournais which dams the river Grand Lay offers sailing, swimming, a beach and fishing. It is truly a beautiful expanse of water, and is also a paradise for those who want to walk around its shores. Moulin Neuf, here the river Grand Lay has been dammed by the barrage du l'Angle Guillgnard south west of Chantonnay. It provides a tree lined lake where you can swim, picnic, fish and ramble in an enchanting and picturesque landscape. Château Guibert. The lake de Marillet at Château Guibert was made by the damming of the river Marillet just above Mareuil-sur-Lay. 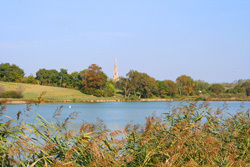 This has made an expanse of water in mainly open countryside which is ideal for boating, fishing and picnics. Coex. The Lac du Jaunay is a picturesque lake in a deeply wooded valley which is ideal for boating, fishing and taking walks. Out of season it attracts large amounts of migrating birds as well as some that overwinter here. The bridge near la Baudriere is the only crossing. Luçon. Les Gufiettes is a nautical centre 3kilometres west of Luçon it has many activities indoors and out. Mervent Forest. The lakes of the Mervent forest are possibly the most beautiful in the Vendée. The beach by the Base Nautique offers swimming, sailing and canoeing, although it is possible to do these activities almost anywhere on the lake. Mesnard-la-Barotiere. Lac de la Tricherie is a pretty lake just outside of the village. It is very popular during the summer for all manner of water pursuits including fishing, boating and swimming. There is a restaurant, mini golf, Adventure Park, camping as well good walks and picnic areas. The lake attracts large numbers of ducks and other water fowl during the autumn and winter. La Roche-sur-Yon. Barrage Moulin Papon. This large lake just above la Roche-sur-Yon is ideal for fishing and sailing as well as rambling. Talmont St.Hilaire. On the edge of town is a large leisure lake with good walks and a children's play area in the shape of castles. 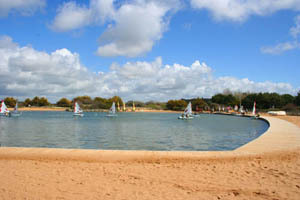 The beach by the nautical centre is ideal for the children and for launching boats, it also has a good sailing school. Pouzages. Lac de L'Esperance is a pretty lake where one can swim and relax, it is a quiet get away and is an ideal stop off for a picnic lunch. Chassenon-le-Bourg. The Lac de Chassenon is just outside of Fontenay-le-Comte and has a private beach which is open to the public during the summer season. This sheltered guarded beach is ideal for children and you can hire boats and canoes.There are plans to redevelop this site into one of the biggest water-parks in the Vendee.